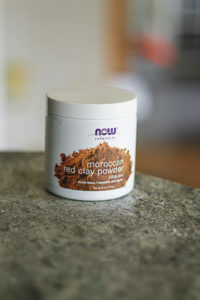 I prefer applying the NOW Moroccan red clay powder mask with a brush. Leaving it on for about 15 minutes. The mask doesn’t have to dry down until you remove it. Just rinse it off after 15-20 minutes and the mask has done what it is supposed to. I remember reading a review that someone said that it colored their skin, I have never seen that happen to me though. But be sure to rinse until the mask is completely gone. This mask is individually packed and I feel that it is a little expensive for the product you are getting. At the same time, the individually packed masks are easy to take with you while traveling. I usually feel that bringing clay masks when I travel is a bit of a hustle due to that I really need to keep it sealed so the product won’t dry out.